Four Seasons in the Life of Val Andrews - Val Andrews - reviewed by Gerald R. Bount, Jr.
Should You Join A Magic Club? 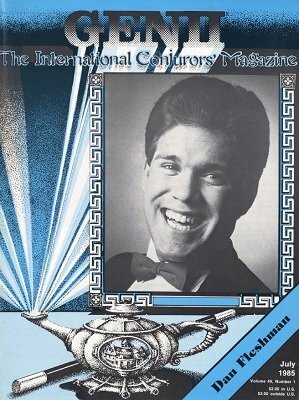 57th Annual convention of The International Brotherhood of Magicians - Kansas City - Walter L. Burrows, Jr. Ultimate Transparent Changebag - Jeff Busby Magic, Inc.
Cover - Louis St. Pierre, Jr.
Penn and Teller "The Bad Boys of Magic"
Cover - Le Grand David Co.
Prime Hole Card - The Topological Card Series, Chapter 1 - Ben Harris - reviewed by Gerald R. Blount, Jr. The Hypercard Experiments - The Topological Card Series, Chapter 3 - Ben Harris - reviewed by Gerald R. Blount, Jr. The Royal Divide - The Topological Card Series, Chapter 4 - Ben Harris - reviewed by Gerald R. Blount, Jr.
Eric Sharp's Specialized Hat Productions & Comedy Magic Sketches - reviewed by Gerald R. Blount, Jr.
G.S. Version of J. le Dair's Aces - Vince Thomas & G.S. Desert Seminar "Complete Conjuror Challenge"
Weston - The Best Yet! - J.C.